1. How do I want to be perceived? Do you want to appear confident and happy or desperate and bitter? Do you dread outlining a dating plan or do you look forward to working toward your goal? My next tip for dating is that your attitude regarding dating and relationships WILL come across to potential suitors. Stay positive! You are doing this because you are choosing to make one aspect of your life better. 2. Start with your goals in mind. My last tip for dating here is to start your plan at the end by determining your goal. Once you determine where you want to end up, you’ll have a much easier time figuring out how to get there. By determining the end point of your dating plan, you’ll be able to clearly and effectively outline your roadmap to love. I often tell my clients that the dating game – when the ultimate goal is a life partner, lifelong relationship or marriage – is a marathon. We’re not running sprints here -keep at your plan and don’t give up! Tweak things a bit. Figure out what works and what doesn’t. And stick with it! PS. Speaking of DATING PLANS…. I am starting my 6 week Internet Dating Success Coaching Program this Thursday night. You will create a plan and take you through the steps to either get you dating online or improve your success rate of dating online. Go to www.attractqualitypeopletodateonline.com for details. 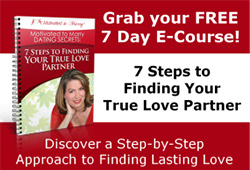 ‹ Dating Advice for Healthy Singles: Watch your nutrition! Great submit, effective blog page, are grateful for tremendous work, go on, fellas!